Ranked 32nd by NIRF (National Institutional Ranking Framework), MHRD, Govt. of India in April 2016. ITM School of Management is one of the flagship and leading B-schools of Central and North India. It has received highest ratings for its learning-outcomes based academic programmers, state-of art Infrastructure, rich academic resources, continuous evaluation system, credit based system and global outlook. The basic intent of the B-school is to impart quality management education at Undergraduate, Postgraduate and Doctoral research levels. Our programmers are a showcase of flexibility, predictability, and transparency. All our academic programmers are based on a system of credits-generally guided by ECTS (European Credit Transfer and Accumulation System) as a proper means of promoting the most widespread student mobility. Dual Specialization with options in Marketing, Finance, HRM, International Business. Rich curriculum designed by Industry and faculties from reputed Institutions like IIMs/IITs etc. Case Based Pedagogy, wherein, popular cases from Harvard/Darden/Ivey etc. are used. Workshops on SPSS, E-Views, Marketing Engineering, Compensation Planning , Business drafting, Entrepreneurship, Managerial Computing using MS Excel, Financial Modelling through Spreadsheet etc. Quality teachers with doctoral degrees and research exposure at prestigious institutions like IIMs, ISB and international Business Schools like Harvard etc. Good blend of faculties with robust academic credentials and rich industry exposure. Fully equipped modern classrooms with LCD projectors; Wi-Fi connectivity. Modern facilities like Seminar halls, with combined seating capacity of more than 800 for conduction of events like MDPs, FDPs, Workshops, National and International Seminars and Conferences etc. Excellent cafeterias; Mini market, state-of-art amphitheater with seating capacity of 3000. Separate and fully secure Hostels for boys and girls. Well-developed modern sports complex with facilities for host of indoor and outdoor games. (Unique training opportunity in the area of banking operations software -FINACLE from Infosys in knowledge partnership with SBP-FLIP]) MBA Dual Specialization entails better career advancement opportunities. This is a two years full time credit based programme spread over six trimesters. This highly sought after programme is a contemporary and challenging programme that uses latest state-of-art teaching learning processes that delivers maximum „learning outcome‟. The teaching-learning process of the programme is unique in North and Central India and is instrumental in placing students in best of the corporate. The teaching pedagogy adopted helps students to develop better understanding about the different corporate sectors with the help of case analysis, live projects and presentations. ITM University Gwalior and FLIP have joined hands to offer a unique industry ready optional module in Banking & Finance. This comes with the most coveted “Smart Banker Program with Finacle from Infosys” to produce trained professionals for Corporate India. Unique, hands on training with live simulations on Finacle. Students will be among the very first to get trained on Finacle 10- the latest version, and gain a strong employability advantage. Practical knowledge of banking products and processes. Advantage in the selection process for both private and public sector banks. Get placement assistance for a period of 2 years. Develop and demonstrate an aptitude for the banking and Finance industry. Acquiring real life Banking operations skill sets vide Finacle Software from Infosys along with Simulations and thereby becoming industry-ready. Develop expertise on contemporary areas like Consumer Lending, Wealth Management, Mortgages, Credit,C orporate banking etc. Getting identified and nurtured as future business leaders. A post graduate degree in general management opens opportunities in areas of management such as Marketing, Human Resource Management, Finance,Operations Management and International Business. MBA students having specialization in Finance and Accounting can choose to work in public, private or government organizations as accountant, comptroller,accounting manager or financial accounting consultant. Students with specialization in finance can opt to work as financial analyst, budget analyst, finance officer,financial manager, financial planner and investment banker. Students with specialization in Marketing and HR can opt to work as Management Trainee, Market analyst,Market Researcher, Marketing Manager, HR Consultant. Other options include entrepreneurship, international business and Consulting. S&P Capital IQ, PwC, Asian Paints, Prometric, Madison Street, iResearch Services, Naukri.Com, Universal Hunt,ICICI Securities, Shoppers stop, Mount Talent Consulting, JARO Education, Agarwal Packers & Movers Ltd, India Infoline • ING Vysya Bank Limited • SBI LIFE • Grail Research • Thomson Press • Unicon Investment • GATI Ltd • Nerolac Paints • Share Microfin • H DFC Bank • Axis Bank • S&P Capital IQ • ICICI Securities • Universal H unt • PwC • Prometric • Asian Paints • JARO Education • Naukri.Com • Shoppers Stop • 99acres.com • Mount Talent Consulting • SBI Cap Securities • Indiamart.com • Unicon Investment •Dolphin Sourcing Pvt Ltd • Antal International Network • PropTiger • Globas • Mancer Consulting Services Pvt. Ltd. The backup of this post in your browser is different from the version below. Restore the backup. Bachelor of Business Administration (Honours) is a three year full time credit based programme spread over six semesters with classroom interaction. It is designed for those who aspire for a career in business whether as an entrepreneur or a professional, both in India and abroad. Industry today has a demand for skilled graduates with dynamic personality, multitasking skills and broad knowledge base. Keeping diverse Industry requirements and enhanced employability prospects in mind both the content and pedagogy have been developed. It aims at providing not only the depth but also the width to a student’s professional competence. The Bachelor of Commerce (Honours) is a three year full time credit based programme spread over six semesters with classroom interaction. The Bachelor of Commerce (Honours) degree imparts in-depth business and management skills to the students. In today’s competitive economy, a B.Com. (Honours) course trains effective leaders and entrepreneurs of tomorrow, whether in India or abroad. The students pursuing CA/CS/CMA have the distinctive opportunity to claim exemption from the paper/s of B.Com..(Honors)/MBA (also existing CA/CS/CMA) they have already cleared in their respective courses. As a result they can get the degree by clearing only the remaining few papers. Senior Secondary Examination (10+2) or equivalent with 55% marks in aggregate from a recognized Board of School Education from any stream. The students pursuing CA/CS/CMA have the distinctive opportunity to claim exemption from the paper/s of B.Com. (Honours)/MBA (also existing CA/CS/CMA) which they have already cleared in their respective courses. As a result they can get the degree only by clearing the remaining few papers. The Bachelor of Commerce is a three year full time credit based programme spread over six semesters with classroom interaction. The Bachelor of Commerce degree imparts business and management skills to students. These skills form the foundation of their careers. It appeals to those who consider a future career in commerce. The students will study all the necessary topics with additional emphasis in their area of special interest. Senior Secondary Examination (10+2) or equivalent with 45% marks in aggregate from a recognized Board of School Education from any stream. Unique pedagogy: to create maximum learning in Honors courses. every paper has a distinctive provision of a hand-on project that creates practical skill–set. Flexible programmes: Choice Based Credit System: Students can complete programme at their own pace and blend it with other disciplines to craft their own degree the way they like. Case Based Pedagogy: Popular cases are used in classes including from Harvard/ Darden/Ivey. Workshops: Unique provision of including workshops as a part of curriculum has also been made. Popular workshops are on: SPSS, E-View, MS-Excel, Business drafting, Entrepreneurship, Law, Finance, Taxation, Accounting and Economics. Quality Teachers: Most faculties have a doctoral degree in management and have defended their research work at IIMs, ISB and international schools like Harvard/Darden/Ivey/Kellogs etc. Register and pay online at http://onlineapply.itmuniversity.ac.in/ or Visit Counselling Cell at ITM University Gwalior Campus or request by post for Registration Form to Counselling Cell of ITM University. Registration fee to be paid by DD drawn in favour of “ITM University Gwalior” or depositing INR, 11,000/- at cash counter of ITM University. In Case of online registration payment is to be made online. ITM University is first to adopt continuous assessment system in M.P. which is being implemented at IITs, IIMs and among best universities of the world.A student is evaluated for his performance in a subject in a continuous manner during a Semester/Trimester. Due weightage is given to class participation, seminars, workshops and project work. Guest Lecture on Dining Etiquette,Mrs. Kanupriya Singh Rathore Chairperson, ITM Universe, Varodara. Through this session students learned Table Setting, Organizing, Event Management Meal Time Interviews, and Business Negotiations. Mr. Sanjay Kumar Rawat Vice-President, Essar-Aegis Aspire Consultancy Services, Mumbai on the topic of “Role of Culture and Leadership in Augmenting Organizational Performance” dated 26-08-2013. Industry interaction with Mr.David Wittenberg-CEO Innovation and Work Group. ITM School of Business has always given training, augmentation and placements an utmost priority and to implement it into action an exclusive training, augmentation and placement assistance cell (TAP) has been established with state-of- art facilities. The cell is headed by experienced professional from Industry. We are proud of world class infrastructure that ITM University has provided to management programmes. All class rooms are equipped with multimedia facilities and other aids that enhance teaching and learning process. Roof top gardens, cafeteria, air-conditioned labs, seminar halls, library & elibrary etc., offers a perfect eco-system for students to groom their careers. CLASS ROOMS The classrooms of the University are all equipped with a white board, a black board and a LCD Projector. The classrooms give maximum flexibility to faculty by offering different ways to communicate and interact with their classes. SEMINAR HALL A seminar hall with all the amenities and seating capacity of more than 450 people at a time is available where we organize a galaxy of events like MDPs, FDPs, Workshops, National and International Seminars and Conferences, visiting lectures or series of lectures etc. LIBRARY Library contains a vast selection of books xand professional journals with digital library of 3000 online Journals via Emerald. AMPHITHEATER State-of-art amphitheater with seating capacity of more than 3000 persons is being used for cultural and co-curricular activities of the University. COMPUTER LAB The University is well equipped with computing resources to cater to the academic needs of the students. The computer labs have over 100 terminals. Softwares available in the lab are Windows 2000 server, Oracle 8i, Visual Studio 6.0, MS Office 2000 server, MS Office 4.3 (Professional) server, MS Project, SPSS , E-Views, Matlab, R etc. PLAY GROUNDS The University has developed a state of art sports complex having the facilities for basket ball / hockey / football / cricket / indoor games and ultramodern gym. High tech stages for performing arts are also being constructed. A sculpture village has come to existence as well. These facilities provide a unique blending of art and technology which ignites the young mind for innovative and creative thinking. HOSTELS One of the key contributors to an intensive & effective learning experience is living in campus. A boys’ hostel with the capacity of approx 800 beds and girl’s hostel having capacity of approx 300 beds located within the campus. The hostel is well equipped with basic recreation & indoor sports facilities that provide students with homely atmosphere to strengthen the feeling of belonging. A semi –mechanized and hygienic mess & dining facility accommodating sufficient persons at a time has also been created. CAFETERIA Apart from structured teaching and learning schedules, the University has provided platforms for relaxation, exchange of views, and free discussions among students and faculty alike by establishing coffee points. ATM & BANK FACILITY Just close to the main gate of ITM State Bank of Indore has its ATM facility which is accessible by all major debit/credit cards and inside the campus one branch of UCO bank is also available for students and staff. We have introduced a new scholarly journal namely International Journal of Management and Cross Cultural Research (IJMCCR). Realising a different historical experiences, physical and social environments in which people result in variety of practices, beliefs, social roles, norms, expressions, forms of organisation and conflicts (economic, political, legal, religious, expressive and artistic) exhibit various sorts of internal coherence as well as cleavages within human communities. Further, these coherences and cleavages not only impact behaviour of human beings as consumers in society but in turn marketing practices of different organisations. The mission of the proposed Journal is to publish peer-reviewed articles that examine impact of cross-culture on marketing and consumption practices that span societies and nations. Indian Institute of Tourism and Travel Management, Noida. Majid, Jenifur; Amin,Shahid and Kansana, Keshav (2016), “A Study on Green Marketing Towards Sustainable Economy, Environment and Society”, Journal GSD-Green and Sustainable Development, ISSN: 2350-1464. Bakshi, Avijit. Dhar, Satyajit(2015) “Determinates of Loan Losses of Indian Banks: A panel Study, Journal of Asia Business Studies”, Vol. 9 No.1, (Emerald), pp 17-32.ISSN: 1558-7894. Khan,Jennifur. Amin, Shahid& Singh, Shilpy (2015),’ The Ethical Challenges of a Performance Evaluation in Services Sector’,The International Research Journal of Social Sciences and Humanities, ISSN: 2320 ‐ 4702. Jenifur, Amin, Shahid and Singh, Shilpy (2015),The Ethical Challenges of a Performance Evaluation in Services Sector,The International Research Journal of Social Sciences and Humanities, ISSN: 2320 ‐ 4702. Mr. SomenMitra, Dr. Rakhi Chauhan, Mr. Prashant Kumar Kushwaha(2014)“A Study on Consumer perception and awareness about Life Insurance at Gwalior Region”, , INNOSERVE 2014 Conference Proceedings, ISBN-978-93-81212-93-6, Edited by Prof. YogeshUpadhyay…Bharti Publications New Delhi. Chakraborty Abhinandan(2014), ‘Entrepreneurship: An emerging trend in developing service economy’, Conference proceedings, Dr.BhagwatSahai Govt. College, Gwalior. Sinha Sanjay(2013), Tiwari Vinayak& Kumar Sunil, Working capital Management and its Effectiveness on the Profitability Cipla Ltd. Co., International journal of Innovative Research in Commerce & management, Vol. 7. Amin, Shahid and Chauhan, Rakhi (2014),Marketing Trends at Newly Business Schools in India: A Case Study on Devious Practices at GBS Srinagar, International Journal of Applied Services Marketing Perspectives.ISSN:2279-0977(Print), ISSN: 2279-0985 (Online). Amin, Shahid, Singh, Shilpy Singh and Chauhan, Rakhi (2015),Perils of Autocratic Leadership: A Case on Pvt. Ltd. Company, Journal of Trade and Global Business Perspectives. ISSN: 2319-9059 (Print), ISSN: 2319-9067 (Online). (Accepted for Publication for Jan-Mar 2015 Issue). Dixit, S. (2014),J. C. Penney: Lessons for Rebranding, The Case Centre, England. Singh, S. (2014),Chasing Dreams-Employee retention posing a serious challenge to Infosys, The Case Centre, England. Upadhyay, Y. and Singh,P. (2014),Maruti Suzuki Recall Swift and Dzire, The Case Centre, England. Gupta, V. (2014),A Historic rejection by Real Owners, The Case Centre, England. Mitra, S. (2014),Diffusion of Innovation at AMB Financial Services, The Case Centre, England. Chakraborthy, A. (2014),The brand Image Issue of ABC- A New Twist, The Case Centre, England. Singh, S. (2014),Nokia Chennai Plant workers facing dilemma of Lifetime, The Case Centre, England. Dixit, S. (2014),Nokia’s Reality Show: An attempt towards dealing with competition, The Case Centre, England. Upadhyay, Y. and Singh,P. (2014),Crash of organized retail in Rural India- A case study on how shut down of HaryaliKisan Bazaar (DSCL), The Case Centre, England. Tripathi , A. (2014),India’s own information System Aadhar-Bane or Boon, The Case Centre, England. Best Paper award on“A study on impact of fluctuating capitals on profitability of Indian Pharmaceutical Industry: With special Reference to Cipla Ltd.” in International Conference on Changing Paradigm of Management Practices for Sustainable Development on March 05-06, 2016 organized by Department of Rural Management School of Management Studies, Baba Saheb Bhimmrao Ambedkar University Lucknow (Central University) by Sunil Kumar and Vinay Gupta. Best Paper award on“A Comparative study on Dividend Policy of Indian Public Sector Banks and Private Sector Banks” in National Seminar on The Pursuit of Business Excellence: Practices in Managing Men, Money, material, Machines and Methods on February 27-28,2016 organized by School of Management Sciences, Lucknow. By Sunil Kumar and Vinay Gupta. 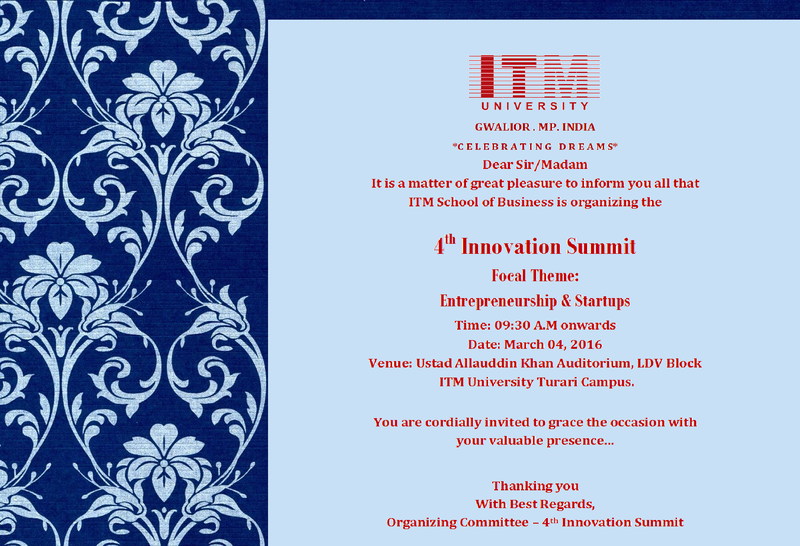 Second rank secured for poster presentation–‘A Study on Green Marketing Towards Sustainable Economy, Environment and Society’ presented at TIMS 2016 – 6th International Conference,ITM University, Gwalior (M.P) by Shahid Amin. Appreciation Letter sanctioned by Shiksha for guiding and counseling students for career on its portal shiksha.com to Shahid Amin. Paper accepted ‘An Empirical Analysis of determinants of Dividend policy- Evidence from the Indian Public sector banks and Private sector banks’ in International Conference on Financial Markets and Corporate Finance organized by IIT Madras to be held on 12-13 August 2016 by Sunil Kumar and Vinay Gupta. Paper presented in International Conference on Changing Paradigm of Management Practices for Sustainable Development on“A study on impact of fluctuating capitals on profitability of Indian Pharmaceutical Industry: With special Reference to Cipla Ltd.”, March 05-06,2016 organized by Department of Rural Management School of Management Studies, Babasaheb Bhimmrao Ambedkar University Lucknow (Central University) by Sunil Kumar and Vinay Gupta. 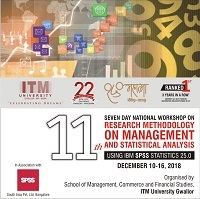 Paper presented in National Seminar on The Pursuit of Business Excellence: Practices in Managing Men, Money, material, Machines and Methods on “A study on Integration of India’s stock market with regional & global markets”, February 27-28,2016 organized by School of Management Sciences, Lucknow. by Sunil Kumar and Vinay Gupta. Paper presented in National Seminar on The Pursuit of Business Excellence: Practices in Managing Men, Money, material, Machines and Methods on“A Comparative study on Dividend Policy of Indian Public Sector Banks and Private Sector Banks”, February 27-28,2016 organized by School of Management Sciences, Lucknow by Sunil Kumar and Vinay Gupta. Paper presented in International seminar on Changing Economic Parameters and Prospectus of Growth in Indian South Asia on“A study on Integration of Indian stock Markets with Global markets.” , February 05-07,2016 organized by Department of Economics, Lucknow University, Lucknow by Sunil Kumar and Somen Mitra. Godrej Consumer Products – Total Quality Mgmt. It is well said that “A sound mind is in a sound body”. A large number of the researches have been undertaken where the authors have discovered a “significantly” positive correlation between physical activity and academic performance. Armed with that knowledge, academic institutions could tailor their physical education and sports programs to benefit both their students’ bodies and their minds. 1) To develop physical fitness by maintaining and increasing such components as speed,flexibility, muscular strength, muscular endurance etc. 2) To develop an understanding of the importance of sport in the pursuit of a healthy and active lifestyle at the University and beyond. 3) To develop an appreciation of the concepts of fair play, honest competition and good sportsmanship. 4) To develop leadership skills and foster qualities of co-operation, tolerance, consideration, trust and responsibility when faced with group and team problem-solving tasks. 5) To promote an understanding of physical and mental well-being through an appreciation of stress, rest and relaxation. 6) To provide healthy competition through inter-school and inter-house matches.